This versatile, split-back sofa sleeper will add contemporary style to any room. The rich, faux-leather upholstery with detail stitching is practical and wipes clean. The sleek, chrome legs gives it a very modern, upscale look. Totally adjustable, this futon lounger lets you easily change its shape three ways from sofa to Chaise Lounge to full size bed thanks to click clack technology. Perfect for Back to School and Dorm Room necessities – student sized for small spaces. Fits in small home offices and guest rooms as well. 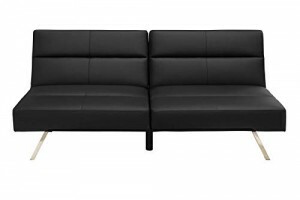 Great fold out couches and lounges by DHP- delivered to your door through Amazon Prime.